MLB.com released its updated list of their Top 50 Prospects today. While 28 of 32 organizations have at least one man on the list, the Brewers are one of 17 clubs that have at least two. This is a quick review of that pair of prospects who just so happened to be teammates already when they took the field together in the 2009 All-Star Futures Games in St. Louis. I will include some comments about the players along with offering a bit of my own opinion about their futures. I won’t claim to know whether or not they should be higher or lower because I don’t pay enough attention to other team’s farm systems, so the ranks themselves will simply get mention here. Believe it or not, despite a batting average over .300, albeit in a truncated Major League demonstration, slick-fielding shortstop Alcides Escobar actually fell three spots from 2009’s list. This drop also came after Escobar won the batting title in the Venezuela League this winter. Escobar practically sprayed the ball all over South America while posting a .393 batting average. He added an on-base percentage of .440 which was good for fifth in the league. Add in his 16 steals (3rd in the league) and it becomes quite evident that Escobar was busy displaying all of his tools this winter. This offseason Doug Melvin cleared the way for Escobar to seize the starting shortstop job when J.J. Hardy was traded to the Minnesota Twins for new starting centerfielder Carlos Gomez. Hardy had a terrible season in 2009 even earning a demotion to the minors for a brief stay. The end result was Hardy being jettisoned to Milwaukee’s interleague “regional” rival and Escobar realizing the role of the Next Big Thing. By all accounts a stellar defender, Escobar’s bat definitely took longer to be considered ready for the big leagues. In fact, some people still don’t think it’s quite ready and that Escobar may only accumulate a .260/.300/.350 type of line. Let’s just say I hope those naysayers out there have a decent recipe for crow. Prediction: Obviously, Escobar will be filled in as position #6 on manager Ken Macha’s Opening Day lineup card. Where he’ll hit in the order is a bit of a mystery for now, however. With the teammates that make up the rest of the order, Escobar really has the chance to be hitting in one of four spots in the order to begin 2010. Those spots are 2, 6, 7 or 8. I personally believe that Escobar will eventually settle in to either 1 or 2, but that might take some time, especially given Macha’s propensity for letting young guys gain experience by batting lower in the lineup. Escobar’s best chance to start the year off in the 2-hole would be to follow the Casey McGehee blueprint of tearing the cover off the ball all spring long. Even still, I expect Macha to slot Escobar in at number 7 to begin the regular season. As far as his long-term prospects? Shortstop is the latest rockstar position in the majors and Escobar could fit right in with the game’s best if he reaches the potential that scout after scout has seen in him. 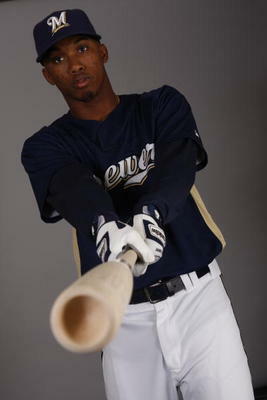 Do I see Escobar’s #21 hanging underneath the track of Miller Park’s retractable roof next to #19 and #4? Not yet, but winning a Rookie of the Year Award in 2010 would be a good way to begin changing my mind. A former 1st round pick (16th overall), Brett Lawrie was selected out of high school as a catcher. He requested the switch to 2B during his first minor-league season in part because 2B stood out to him as his quickest path to the majors. After finishing the 2009 minor league season already with the Brewers’ AA affiliate Huntsville Stars, Lawrie apparently has the right idea. Incumbent 2B Rickie Weeks has had a history of inconsistent play and a few significant injuries as well. Should he falter again or lose another season to injury, he might just find himself pushed right out of town by the brash, young Canadian. Lawrie has played for Team Canada in the Olympics and World Baseball Classic as well as participating in the 2009 All-Star Futures Game as a member of Team World alongside Alcides Escobar. While he doesn’t even consider himself the best athlete in his own family (Lawrie says his older sister has that honor), he definitely seems poised to legitimately take over as the system’s best. Prediciton: MLB.com has Lawrie projected to reach the majors in 2013. This is no doubt mostly due to his still learning to play second. He is a pure athlete at heart and should have no problem continuing his ascent. Lawrie has shown flashes of a full toolbag and, given time, he ought to be able to ply those wares in the big leagues for a while. I’m personally going on record as saying that 2012 could be the year that we see Lawrie get his first significant stint in the big leagues. By all accounts he’d preferred to reach the majors on April 5th of this year, but I’m sure the realist in him knows that the competitor is being a bit irrational. So there you have it. It’s a simple review, but it’s a review nonetheless. The main things we can hope for going forward are for more and more of our players to continue to warrant consideration for this list. After all, players rarely make the big leagues without being recognized as a top prospect first as some point along the way. Ya Gotta Have Hart, Right? But Does Milwaukee Need Him?